If we had to recommend a single intelligently written, fact-filled book to explain why we are vegan, this would be the one. The format of this meticulously researched sequel to Diet for a New America makes it easy to read. 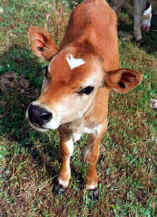 With sections labeled "What We Know", Robbins presents referenced facts which refute the animal agriculture's and other industries' propaganda quotations which appear in blocks labeled "Is That So?". The Food Revolution presents a hands on way of correcting many of the evils of this world and reminds us of Paul's letter to the Romans, where he speaks of the whole of creation anxiously awaiting the children of God to be revealed in order to free it from its slavery to corruption and untold suffering (Romans 8:18-25). John Robbins' blueprint includes removing the food borne causes of diseases, which are almost exclusively centered around the meat and dairy industries. By stopping the eating of animals and their by-products, we likewise stop the pain, suffering and death being inflicted upon the animals. And, by eliminating animal agriculture we conserve billions of gallons of water and prevent most of our soil and water pollution. We often chuckle when we hear of water conservation alerts urging people to take shorter showers and stop their washing of cars. The average person uses about 85 gallons of water a day, including such things as washing cars and taking leisurely showers. John Robbins clearly presents the facts (including those of the meat industry itself) that at least 30 times more water is used to produce a pound of meat than is needed to produce a pound of plant food. This means that if the average person eliminated only 1/4 pound of animal food from their diet per day, they would conserve more water than the whole family would use for daily living. The Old McDonald's Farm concept has faded into obscurity, having been replaced by the Factory Farm, as John Robbins clearly depicts with photos and descriptions. Our food is our future, Robbins concludes, and unless we reverse our present trends in animal agriculture, we most likely will have a very dismal future. 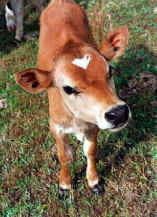 A vegetarian (vegan) diet is our only hope for a viable future. 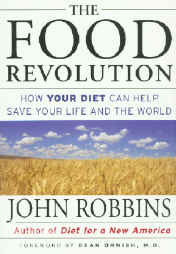 The Food Revolution is a must read! 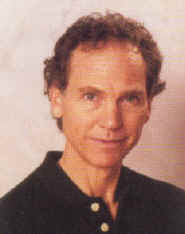 JOHN ROBBINS is the author of numerous bestsellers, including Diet for a New America. He serves as a director of many nonprofit organizations concerned with the environment, health, world hunger, genetic engineering, and the welfare of all species. A popular speaker, founder of EarthSave International, and chairman of Youth for Environmental Sanity (YES! ), he lives with his family in California.